When you are planning a regal event, you want your entire decor to greet your guests with elegance. Besides setting a beautiful table, you want your chairs to match with the rest of your classy tablescape. By renting our chair covers, you can transform any seat into a stylish and refined addition to the room. They are simple to place over any of our chairs that we offer. You can easily change an ordinary plastic seat into something dynamic. 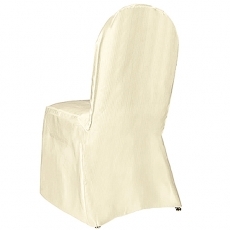 With our chair cover rentals, you will definitely make a great impression at your next party.